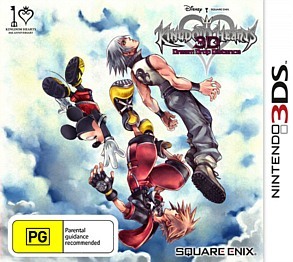 Kingdom Hearts 3D: Dream Drop Distance 3DS Review. With lush graphics, engaging gameplay, Kingdom Hearts 3D: Dream Drop Distance is a must have 3DS game, even if you have never played the previous games in the series. Kingdom Hearts returns to the console world and this time it has received a 3D makeover in Kingdom Hearts 3D: Dream Drop Distance. For the uninitiated Kingdom Hearts takes gamers through the wondrous worlds of Disney and Final Fantasy as King Mickey and court magician Yen Sid (Fantasia) send their two greatest warriors, Sora and Riku to the land of Sleeping Worlds. Why? 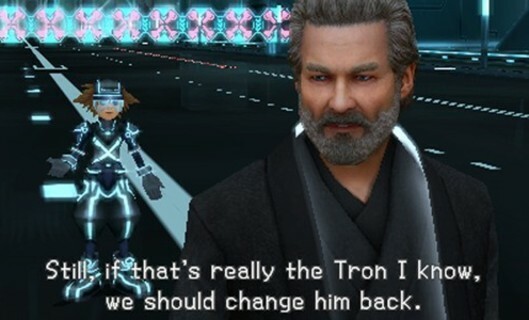 Because they need to become the Keyblade Masters to defeat the villainous Master Xehanort. Oozing with classic Disney, these characters venture through seven worlds based on various Disney films and locations such as Tron: Legacy and La Cité des Cloches (The Hunchback of Notre Dame). Needless to say, Level design is very impressive, even in this cartoon bubble. 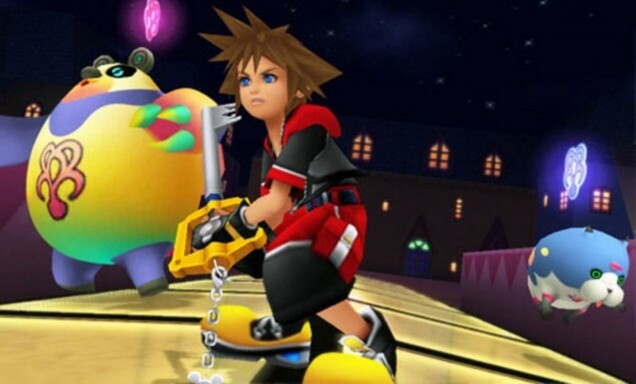 Another interesting element of the game is that the player controls both Sora and Riku throughout the game which enhances the overall story telling of both characters thanks to the "drop" system. At its core, Kingdom Hearts 3D: Dream Drop Distance is an adventure game with similarities to the Final Fantasy series which has a healthy amount of combat. 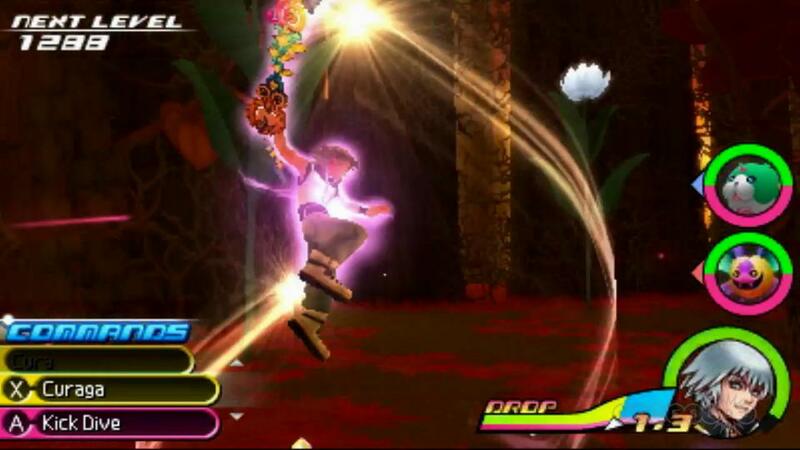 Sora and Riku level up as you progress and each have their own unique abilities when fighting enemies with access to a variety of weapons and spells. The drop system does add something fun to the game, especially as you can switch between the main protagonists quite smoothly. This does enhance your gaming strategy. 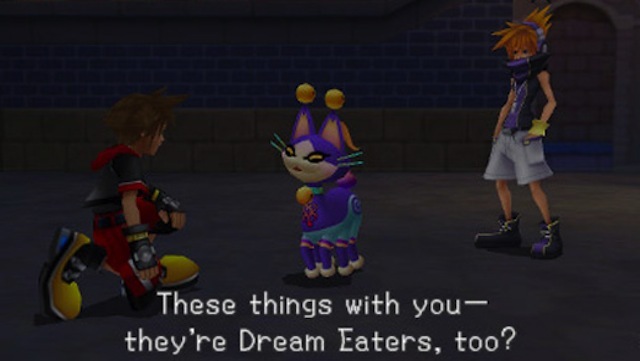 As opposed to fighting Disney or Final Fantasy characters, your party of adventures battles dream eaters that are split into nightmares and spirits. Nightmares can take the form of just about any creature, however spirits just like final fantasy are used as party members. You can also level these creatures up from fighting and even play mini-games with them that has parallels to Nintendogs. Similar to previous Final Fantasy Games, Sora even has the ability to chain attacks with spirits in order to create some devastating combos. With that said, the game supports over 50 different Spirits that can be recruited by your characters. Controls work quite well on the 3DS and it does support the circle pad pro which assists in movement. One new control mechanism in the game is the Command Deck which easily allows you to move between attacks and defence mechanisms. You can even use the environment during battles with the new "flowmotion" technique that allows you to interact with the gaming environment. However for the majority of the time, melee and magic attacks is the way to victory. Needless to say, you need as much RPG experience while playing this game to traverse the seven worlds to face the big bad at the end. Graphically Kingdom Hearts 3D: Dream Drop Distance does a great job at recreating the various worlds and characters from both the Disney and the Final Fantasy franchises. When you interact with the Disney characters in the game, they look and act like their cartoon counterparts and more importantly, each of the different worlds that you visit influences the gameplay of the title. Special effects looks great, especially when linked to the 3D capabilities of the 3DS with some good use of depth. To compliment the graphics, the soundtrack works extremely well with the story that not only pulls at your emotional heartstrings but changes when the battles commence. Everything comes together quite well in this regard. Kingdom Hearts 3D: Dream Drop Distance is definitely a precursor to Kingdom Hearts III which proves as a valuable link to the next game. Without spoiling the story of Dream Drop Distance, there's some great gaming moments in the title that really take this franchise to the next level, especially the ending that will leave most gamers craving for more. The control system works perfectly on the 3DS and the developers have ensured that the capabilities of this console are not just used for gimmicks but rather, they are integral to the gameplay. With lush graphics, engaging gameplay, Kingdom Hearts 3D: Dream Drop Distance is a must have 3DS game, even if you have never played the previous games in the series.